While the representation of both time and space seems complete, the artist apparently felt compelled to go beyond what we see in the foreground. Deepening the illusion of space, he extended our view into the building through a receding vista of arches and half-open doorways on the right. 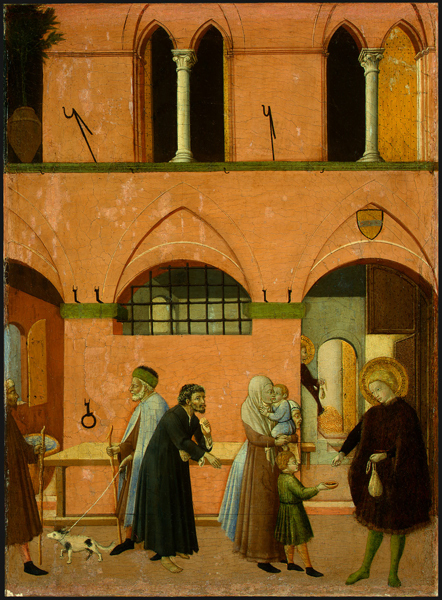 While looking back into space we are also looking back into time: in the middle distance Saint Anthony reappears—at an earlier moment in the narrative—descending the stairs with his purse in preparation for distributing money to the poor. The innocuousness of his action makes plain that the enlargement of time does not contribute much to the unfolding of the narrative. Rather, it heightens our awareness of the temporality of the focal event, encouraging us to see it as just one moment in a continuum of many. In the panoramic landscape settings of many fifteenth-century paintings, similar instances of continuous narrative are employed in ways that have less to do with telling a story than with amplifying the sense of time. Looking beyond the foreground in representations of the Adoration of Christ, we often glimpse previous or subsequent narrative episodes tucked away in the far distance. As a rule, the small scale and remote placement of these scenes precludes a sense of narrative cohesion. Instead the unobtrusive incidents seem to be vestigial remnants of the continuous narrative tradition, which by the fifteenth century served the purpose of associating the distancing effects of space with those of time. The development of these distancing effects becomes clear though comparison of three examples of continuous narrative. 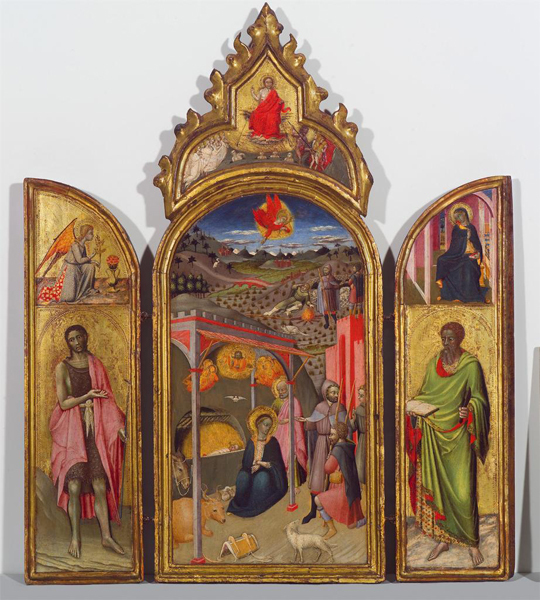 A mid-fifteenth-century triptych shows a Nativity scene with shepherds arriving to pay homage to the newborn Jesus in the manger. Directly above them, in the background, smaller versions of the same figures enact an earlier chapter of the narrative—startled in their field by an angel who tells them where to find the newborn savior. We see clearly that one event leads to another. By contrast, in the Adoration of the Shepherds, c. 1505, by Giovanni Agostino da Lodi the awakened shepherds are miniscule and sit at a far greater remove from the central episode, the Nativity of Jesus. 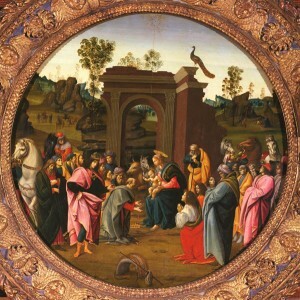 Finally, in the foreground of a tondo painted around 1490 by Bartolomeo di Giovanni, our attention is almost entirely absorbed by the splendid depiction of the Adoration of the Magi in the foreground, complete with camels referencing the exotic Eastern origins of the three wise men and a ruin symbolic of the beginning initiated by Christ’s birth. 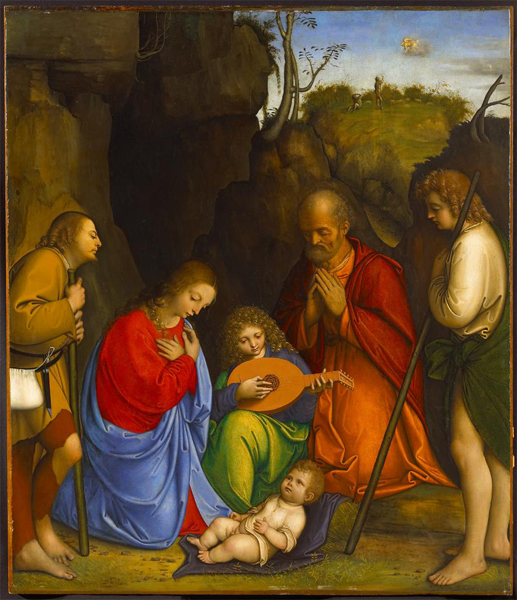 We might easily overlook the tiny vignettes in the background representing earlier moments in the narrative: the journey of the Magi at upper left and the shepherds’ visit to the manger at upper right. The remote scene functions almost subliminally, like a distant memory, reminding us of what has gone before.